As promised last time, I'll give you the backstory on this little number. Both the ivory floral and the peach solid were pieces I picked up at the thrift store (on separate occasions). Originally I had decided that the peach nylon would be perfect for a crinoline. So I ripped lengths and gathered. There are two identical layers to this skirt. The top tier is 3 1/2 yards long; the bottom ruffled tier is 7 1/4 yards long. I attached it to a waistband (with a back zip) and tried it on. It was the most disappointing crinoline ever! All that yardage amounted to virtually nothing. 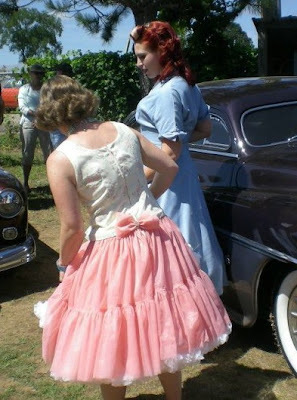 So I tossed it aside, assuming I would double it up with another crinoline when I wore it. Fast forward a few weeks to the occasion of the ivory floral purchase. It is a lightweight polyester with flocking on the pink flower petals! This piece was just begging to be something important. I decided to rip apart the peach crinoline and try again. 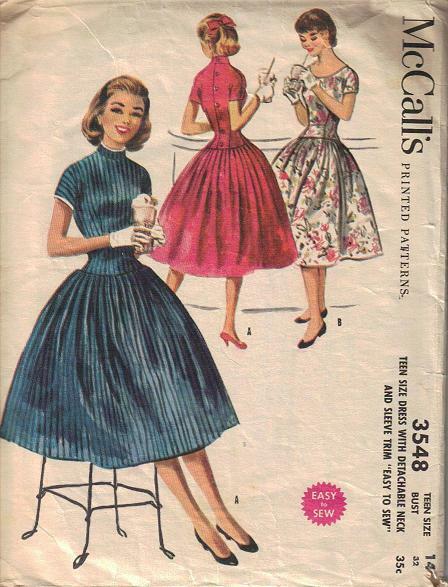 I chose McCalls 3548 (dated 1955) because I liked the dropped waistline. I didn't have enough of the floral to do sleeves though so I altered the top. I also used a center back zip instead of buttons. I lined the bodice with a lightweight cotton and used it as my muslin. Once the lining fit how I wanted it to, I cut out the floral to match. I also added a one inch band to cover the seam where the skirt joins the bodice. It seemed to clean it up a little. But the dress was still lacking. Using my small scraps, I decided to make bows. ...having two bows out of each fabric, there were a lot of options. The bows could be doubled up or even used on the back of the dress. Then I found a rhinestone button to use! What's a girl to do! For the show I wanted to wear my heavy pearl necklace (four strands of graded pale green! ), so I opted to keep the bows away from my face. Here's a photo of me and my best friend, Lucky Piper. We grew up together on the same street, rode the bus all the way through high school (well, she had a car eventually). Now she's a PhD of Geology teaching in Alabama, takes regular trips to Antarctica for seismic research, and buys shoes that cost more than my refrigerator. I'm a stay-at-home mom, running groceries and shoveling out the chicken coop, and still we have the best conversations! Anyways, I opted to use a single bow in the lower back of the dress. This is a behind-the-scenes shot during the calendar shoot with Rubie Lee. 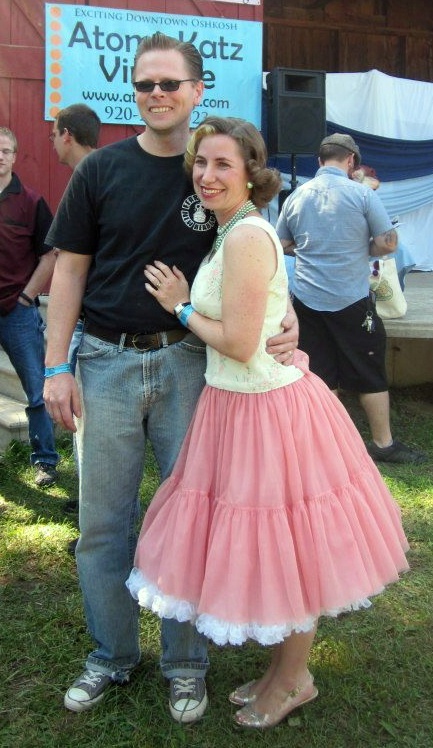 She wore a gorgeous, vintage blue dress and crinoline. 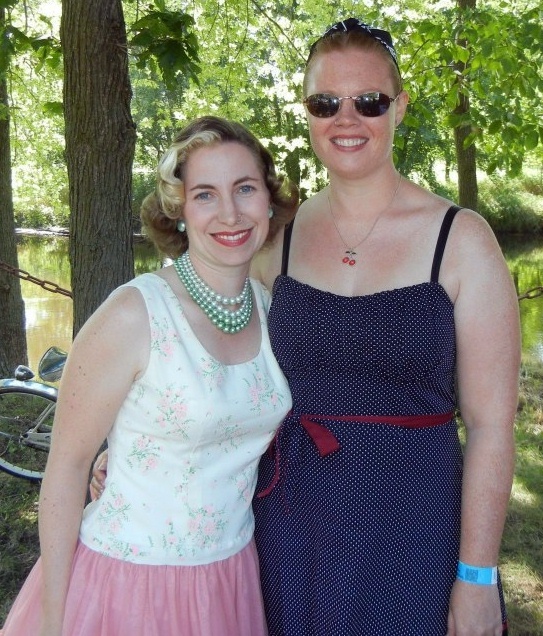 To top it off, she had a necklace almost identical to mine in graded pale blue pearls with five strands! So jealous! Overall I'm happy with this project. I haven't done much dressmaking this summer, but this was worth the wait. It was nice to have something new to wear to Symco that was comfortable and unique. Again, I'm reminded why I sew! I would love to be able to sew. Both the dress and skirt I made fell apart in the washers. In my defense. I tried doing it with out any knowledge of sewing. YOu look lovely. I like the bow placement good choice. You really look great in that dress! You did a lovely job. Stop by saturday and post it on my sewing link party! Gorgeous! You did an amazing job. I have a half-done crinoline staring at me from across the room. I think I'll go finish it now. You are looking so gorgeous! I think the dress and pearl necklace seem to be made for you. It'd be great to see more dress from you. Love your cocktail dress, so lovely and sweet! WOW! What a classy inspiration!